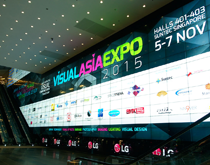 Visual Asia Expo 2015 was the first of what the organisation hopes will be an annual recurring event that focuses on visualisation. Judging from the wide variety of visitors, coming from different sectors of industry, the term visualisation can cover a lot of things. Here is a quick impression.